Count on Help A Hero Hear for discounted and fairly-priced hearing aids. We provide a hearing test, fitting, and complimentary device programming for military veterans, police officers, firefighters, and their immediate family members. Member, Better Business Bureau | Like Us on Facebook™! | Visit Our Other Website! | Check out Our Program Brochure! 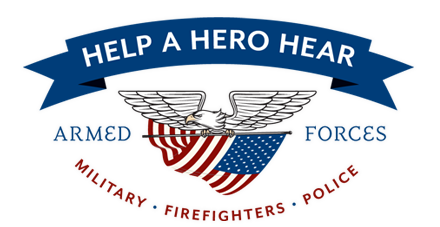 Help A Hero Hear is a beneficial hearing aid program for seasoned US servicemen. Based in Hagerstown, Maryland, we offer discounted hearing aids, fittings, and programming for police officers, military men, firefighters, and even their spouses and dependents. With more than 35 years of experience, we pride ourselves in providing reasonably-priced hearing aids to our valued and honored veterans. veteran police officers and other servicemen.